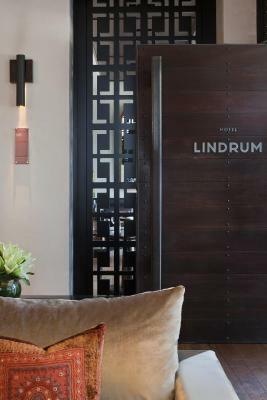 Lock in a great price for Hotel Lindrum Melbourne - MGallery by Sofitel – rated 9.1 by recent guests! A lovely boutique hotel in a great location- walking distance to the stadiums and great restaurants. The bed was really comfortable, lovely restful decor , top class. Warmth and friendliness of staff at reception, and all employees. The boutiqueiness. The position is perfect for all things Melbourne. The room has great chaise lounge and chairs. The tea on arrival is always a hit. Lovely comfy robes and beds. Breakfast was lovely. We keep going back! Room was spacious and the bed super comfy. The a/c was so quiet we didn’t notice it. Products in bathroom were beautiful. We stayed in the Junior Suite and dined at the Felt Restaurant to celebrate our 10th wedding anniversary. We were treated as VIPs from the moment we walked through the door and at all times during our stay. I could not rate the Lindrum and its staff highly enough. There was a lovely birthday surprise of sweet snacks in our room for my husband’s birthday which was very thoughtful. Everything and I would ordinarily find something to find positive feedback on that could improve a stay. The Lindrum exceeded expectations, Staff were wonderful irrespective of role, the bed was sublime, the rooms generous and perfectly appointed. The vibe perfectly balanced. The service, rooms and location were all excellent. Great value for money and our room was huge! The staff were fabulous! We were welcomed by the staff and the ambiance from the moment we stepped into the lobby. A lovely room, super comfy beds and pillows, great housekeeping and reception staff. Room was quiet with no noise from other guests or outside traffic. Interesting and comfortable hotel. Staff service outstanding. Food very well prepared. 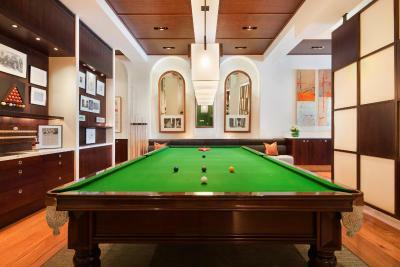 Hotel Lindrum Melbourne - MGallery by Sofitel This rating is a reflection of how the property compares to the industry standard when it comes to price, facilities and services available. It's based on a self-evaluation by the property. Use this rating to help choose your stay! One of our best sellers in Melbourne! 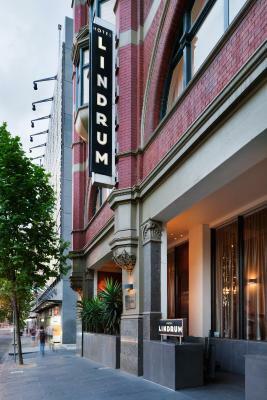 Hotel Lindrum Melbourne has boutique accommodations on Flinders Street, in the center of Melbourne city. It features an on-site restaurant and a bar. Guests enjoy free Wi-Fi, a 24-hour front desk and room service, and access to a nearby fitness center. 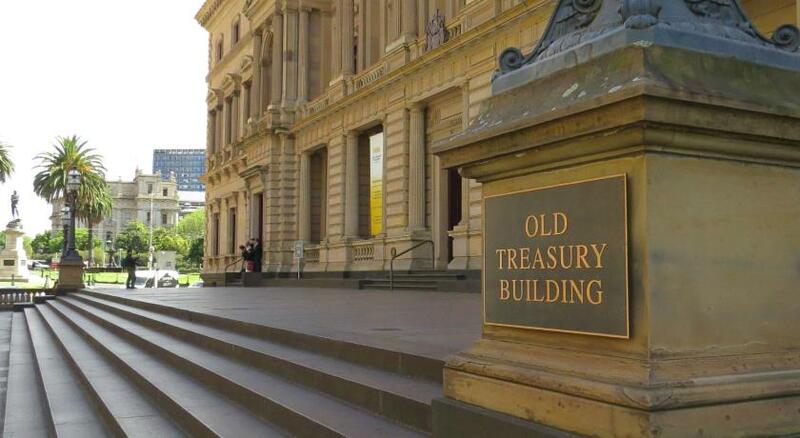 Enjoy the best of Melbourne shopping, galleries and restaurants, all within a 15-minute walk. 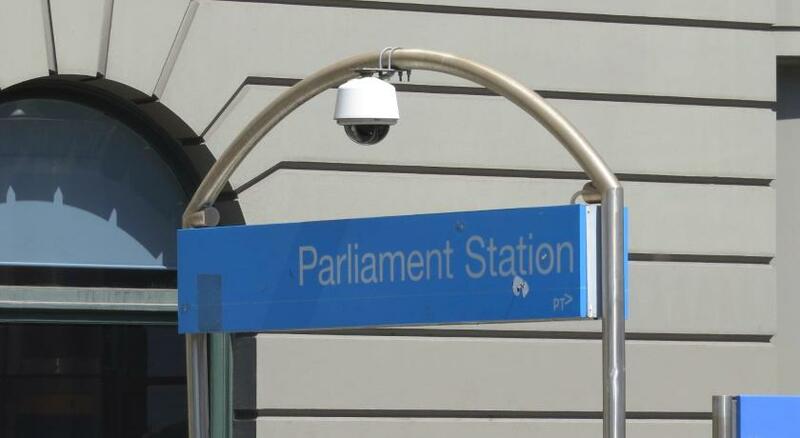 There is a free City Circle tram stop 30 feet away and the nearest train station is a 3-minute walk. 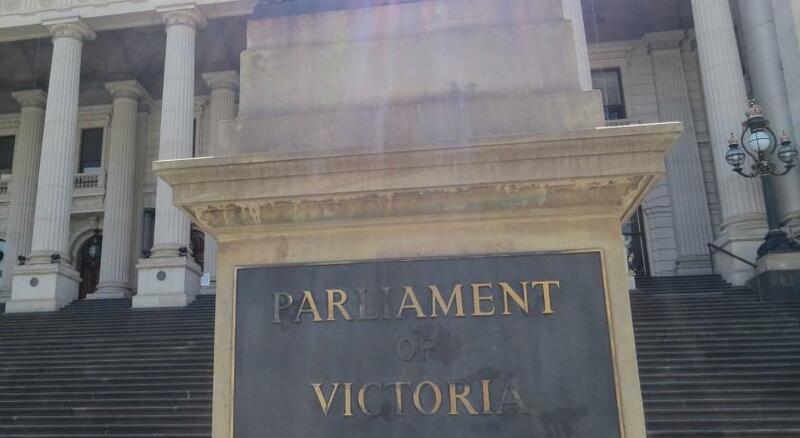 Melbourne's sports prescient of Melbourne Cricket Ground (MCG), Rod Laver Arena and AAMI Park are all within a 3-minute drive. Offering modern décor, all guests rooms are recently refurbished and offer luxury bedding, an LCD flat-screen TV and a Philips Dual Docking station. Private bathrooms offer free organic toiletries by Appelles Apothecary, bathrobes and slippers, and a rainshower over a bathtub. Other facilities available include daily newspaper delivery, and discounted off-site parking. 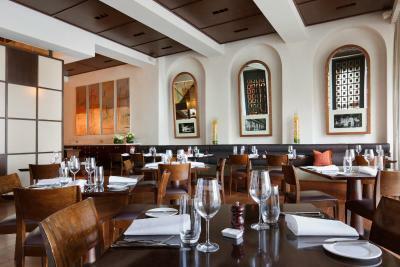 Named after Hotel Lindrum's famous pool table, Felt Restaurant is open daily for breakfast and dinner. Also on the ground floor is the Back Bar which features lounges and an open fire place. This lavish space is the ideal setting to relax after a day exploring the city. 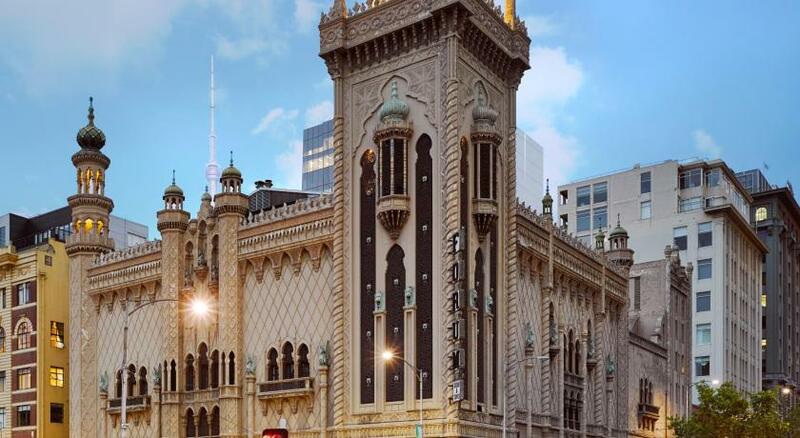 When would you like to stay at Hotel Lindrum Melbourne - MGallery by Sofitel? This room features a pillow menu and a stylish chaise sofa at the foot of the bed. It also has LCD flat-screen TV, complimentary Wi-Fi internet access, a DVD player, tea and coffee-making facilities, a CD stereo with use of CD library, a gourmet minibar and Satellite TV channels. 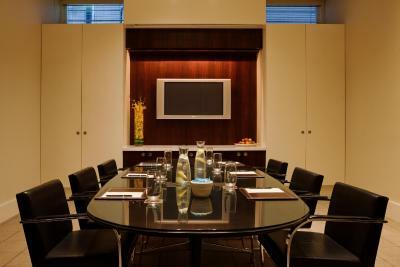 Other features include air conditioning and heating, complimentary daily newspaper, an in-room safe, and a work desk. This Junior Suites is at the back of the hotel and has four large windows creating an abundance of light and an open inviting atmosphere. It has a sleeping area with luxurious king bed complete with a deluxe feather comforter. It also has a bathtub and a rain shower, pillow and CD and DVD menu, as well as a relaxation area and work space. This room features modern boutique decor, a pillow menu, LCD flat-screen TV, complimentary Wi-Fi internet access, a DVD player, tea and coffee-making facilities, a CD stereo with use of CD library, a gourmet minibar and Satellite TV channels. Other features include air conditioning and heating, complimentary daily newspaper, an in-room safe, and a work desk. This room features a pillow menu, LCD flat-screen TV, complimentary Wi-Fi internet access, a DVD player, tea and coffee-making facilities, a CD stereo with use of CD library, a gourmet minibar and Satellite TV channels. Other features include air conditioning and heating, Complimentary daily newspaper, an in-room safe, and a work desk. This studio has a bathrobe, tea/coffee maker and flat-screen TV. 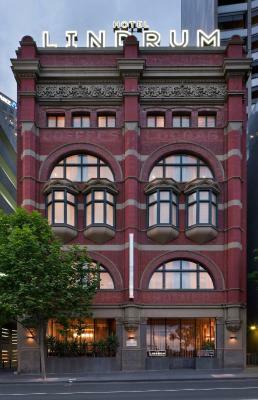 The property is a stylish boutique Melbourne hotel featuring 59 hotel accommodation rooms, a boardroom, the Felt restaurant, a bar and a unique Billiard room. 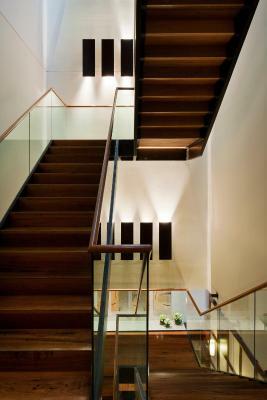 House Rules Hotel Lindrum Melbourne - MGallery by Sofitel takes special requests – add in the next step! 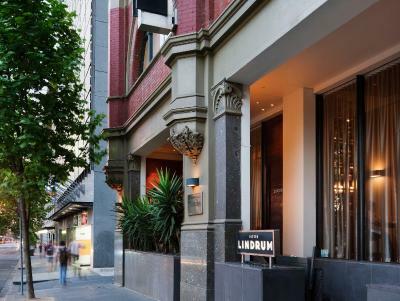 Hotel Lindrum Melbourne - MGallery by Sofitel accepts these cards and reserves the right to temporarily hold an amount prior to arrival. Breakfast was great. Staff were wonderful. The room was quite old and not a great view. Didn't feel luxurious in the room - however the lobby and restaurant was gorgeous. The staff were great. The hotel is beautiful. The beds are so comfy and parking is very convenient. Room had no natural light - the window faces car park. This should be clearly mentioned when booking is being done. Property said that due to booking done on booking.com the front facing rooms are not allotted. No natural light in our room, as unable to open blind. Not a fan of shower in bathtub for this level of hotel, shower pressure and temperature fluctuated. Burnt out globe mid column in felt. Minor. I cannot sleep with a duvet and when the maid noticed I had pushed it aside and had the blanket out, s/he made the bed up the second and third nights sans duvet and with the blanket. Nice attention to detail, track him or her down and reward them!